Disney on the Brain: Short Update and Matterhorn! Welcome to another famously short blog post explaining why I have no time to update this blog like I need to. I'm actually getting rather jealous of my sister, who not only posts daily, but has the time to do it constantly. If you actually want to read something once in a while, check out her blogs at The Shady Glade and Disney World Girl. Enough with the blatant advertising. I said in my last post that I would update during the summer after school got out. Well, school got out and I spent a month in Idaho, visiting family. Then I got home, ready to blog, but my summer homework caught up to me. So now I still don"t have time to blog. In fact, I should be working on it right now, but I'm taking what you could call a short break. Now on to the main part of this post. In catching up on Disney news, I learned about quite a few new things. I'll start off with a few updates that you may have heard about already. Cosmic Waves over in Tomorrowland (the giant marble in front of Space Mountain) has recently been turned into a shady spot with some new planters. The Orange Stinger finally went down to be converted into the Silly Symphonies Swing. The Timon Parking Lot is closed and being torn up for the construction of Cars Land. The Blue Sky Cellar has closed temporarily to allow for new exhibits to be installed. It will reopen on July 16th, the day before Disneyland's 54th birthday. "Yes the rumors are true, Team Disney Anaheim approved the money this week for a '09 Halloween overlay for Space Mountain, using much of the equipment installed in '06 for Rockin' Space Mountain. 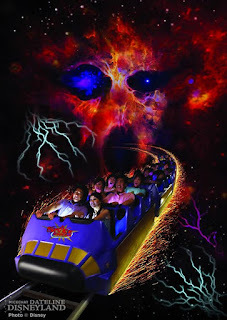 Based on the Ghost Galaxy version of the ride in Hong Kong, this version will now debut at Disneyland on September 25th, after a two week closure." Interesting.... I will have to do some research on this Ghost Galaxy. Unfortunately, where I was able to see Rockin' Space Mountain, this I won't have the chance to see. I have posted a publicity picture of the Hong Kong version at the bottom of the post. As well, the Matterhorn turns 50 this year. The OC Register ran a few articles on the Matterhorn, the most interesting of which included a graphic of the Cast area at the top. You can view the whole article HERE, but I have posted the graphic at the bottom of this post. That's all for right now. I have yet to update the Picasa Albums, but I hope to find pictures of the updates I mentioned above and post them. I hope to get some daily posts going later, as I have finally found my Page-a-Day Disney Trivia calender that was lost in my move. As always, you can comment here on the blog, vote in my polls in the side bar, or email me at DisneyRikua@gmail.com. Thanks for reading!